What would you do if you were faced with either surgery or a choice to see a chiropractor first? That was the decision that my mother had to make which, in turn, changed not only our own lives, but the lives of many others to come. After being rear-ended in a car wreck and having the back seat of the Chevette broke on her back from a force so great that the rear view mirror actually flew back and hit my mother in the head, she was rushed to the hospital. As the driver, sitting at the stoplight, I was “unharmed,” and was not admitted to the hospital, and so was the other passenger. My Mom spent about a month in the hospital, and the orthopedists were considering some organ surgery, but suggested that she see a chiropractor first and then see what would be necessary. Before she returned home, I, who had been a very good student prior to this, was walking around in a daze, but didn’t even realize it. My grades started dropping, and my life going downhill. When we started driving her down to the chiropractor, Dr. Richard Ottaviani asked her, “Who else was in the car?” After she told him that I was, he suggested that she bring me in to see him. Thank goodness she listened to his recommendation! After a few weeks, my life felt like it returned. Before being adjusted, I didn’t realize how bad it was. Needless to say, my mother never needed the surgery. Not only did that chiropractor change my life, for who knows how I would have gone through life without those adjustments, but he also encouraged me to see an old fraternity brother of his when I went to college. At that time, I was semi-considering chiropractic as a career, but wasn’t settled. It was Dr. Frank Wisniewski, who also took the time to teach me what about Chiropractic Philosophy. He gave me books, talked with me and hired me to work in his office so that I could get a sense of what it was all about. He showed me that healing comes from within and that, without interference in the nerve system, the body can and will heal. Day after day, I was able to see everyone from newborns to the elderly coming to get their spines checked for subluxations and see how much healthier and happier they were. I wanted to be able to bring that into people’s lives as well! Though a few schools interested me, Life University was the place that I chose after I received my Bachelor of Science in Biology from LaRoche College in Pittsburgh, PA. What I particularly loved about Life was that there was so much to offer and so many other students with which to interact and really get to the depths of what chiropractic is. If one were to ask me what I’m attempting to achieve through practice, the first answer that comes to mind is that, of course, I want to find and help people integrate their subluxations. I see the subluxation as an opportunity for growth. For where there is a subluxation, there is some kind of stress which has overwhelmed the body in a way that the body cannot recover or integrate that stress, be it physical, emotional, mental or spiritual. My objective is to assist the body in integration, so that they can heal properly. At the same time, I intend to offer people hope, faith and reconnection. Though the human body is an amazing thing, when there is interference in the nerve system, the body cannot and will not work to its best ability, whether it is on a physical, emotional, mental or spiritual level. At our office, we help with that. Over the last couple of years I have expanded my awareness in the field of Detoxification and Nutritional Supplements. I also offer this service to people to support what we do in the practice. In our office, about thirty to forty percent of our patients are kids. I love that! I love seeing the babies that respond so quickly to the gentle care that we offer. I love when the moms come in and say that their baby finally rested, or isn’t fussing or colicky, or finally had a bowel movement, or is just plain happier. I love seeing the kids that have grown up in the office that are so healthy that they sometimes ask when they will ever miss a day of school for being sick like everyone else. Although there are big so-called “miracles” happening everyday here, it is the seemingly everyday ones that make me smile the most. 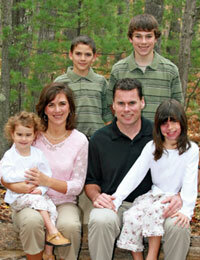 Dr. Kurt and I have 4 very busy children – Kyle, Andrew, Annaliese and Jenna. The boys adore hockey and, though they love the teams that they play on, they can be found just as much or more, playing with their friends on the outdoor rink that Dr. Kurt puts up every year in our yard. They also play baseball, lacrosse, golf and love the beach. They love creating new sticks for themselves and others. Annaliese is a competitive gymnast and loves soccer, softball, acting, singing and drawing as well. Jenna, loves fashion, taekwondo, dancing, and just about anything else she can to keep up with the older kids! Though spare time is hard to be found in our busy lives, I enjoy running, biking, and cross-country skiing in the woods. There are few times that I wouldn’t want to be outside doing something, or at the beach where, on a beautiful day, I could lay there for hours. Dancing is one of the activities that I hope to have room for in the future, as I purely love to move. I enjoy choreography and teaching others to move creatively. In the past, I have worked with adults, children and athletes in a series of classes which help to integrate the brain and body, and restore connections that are often lost in the first year of life. I am happy to say that I have not touched an over-the-counter or prescribed drug in the past 20+ years. I started receiving chiropractic care when I was 16 and have continued now into my adult life. Every week I make it a point to get my spine checked for subluxations to make sure that my body is working to the best of its ability. We also make sure to take care of ourselves. We exercise, get good rest, limit the amount of sugar in our diets, eat wholesome foods, practice healthy habits and have a positive mental attitude. The children benefit from this as well. They all get their spines checked every week as well and eat very well. None of the children have ever had any drugs for any kind of ailment and none have been vaccinated. They are amazingly healthy, coordinated, and beautiful children.